Kerfuffle is Nebraska's only theatre and dance company devoted to creating performances intentionally for children under 6 years old and their caregivers. Kerfuffle brings high quality, aesthetically pleasing and emotionally interesting theatre to very young audiences. Made up of an ensemble of artists who teach, write, design and perform, we create playful, multi-sensory theatre with and for preschool children. Join Bear, Fox, and Dinosaur on a journey through a fantasy forest to meet a curious Caterpillar! The Caterpillar’s Footprint is an original, highly visual and sensory friendly theatre piece that is specifically for very young audiences of children between 2-5 years old and their grown ups. The play is performed inside a 14-ft in-diameter Yurt Dome, and features puppets, gentle music, and moments of audience interaction. 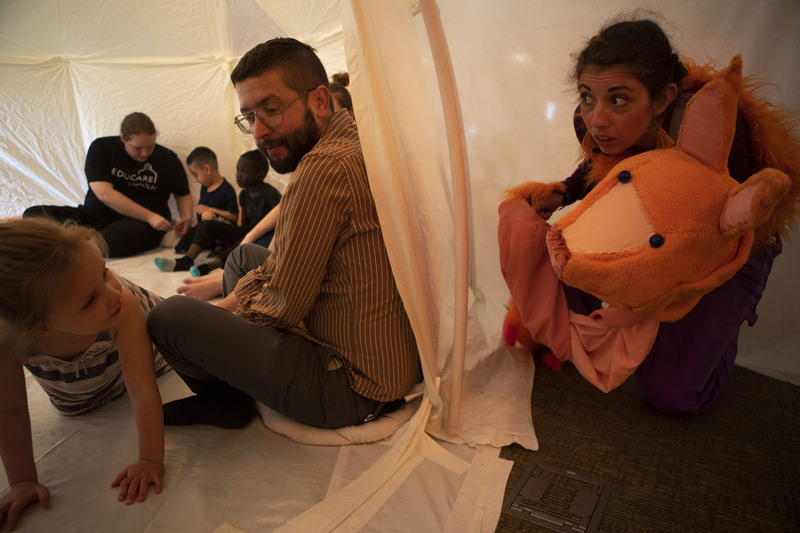 Beginning in a fantasy forest with lavender-infused flowers, bubbles, and comfy cushions before moving into the intimate Yurt Dome, The Caterpillar’s Footprint is an ideal first theatrical experience for very young children. Pre- and post- show creative drama workshops are available to early childhood and preschool classrooms, facilitated by one of the artists, who are experienced Early Childhood Teaching Artists. The workshops will encourage kinesthetic exploration of the play’s themes through movement and song. The pre-show workshops will prepare students for the show they will see by introducing characters and story, and inviting students to embody and explore as the play’s characters; the post-show workshops will invite students to recall the play, and use their bodies, voices, and imaginations to envision new adventures for the play’s characters to go on. Workshops may range from 30-60 minutes. Additionally, study guides with creative drama activities for the early childhood classroom can be available to teachers. Professional development workshops for teachers are available, facilitated by Ashley Laverty, Kerfuffle’s Artistic Director and experienced Early Childhood Teaching Artist. Technical Requirements: Performance space measuring at least 20 x 20 (a multipurpose room or classroom with a flat floor). A stage is not necessary. Access to the performance space ceiling to hang fabric and electrical power is required. Availability: No travel limitation or schedule restrictions at this time.